Run rather than hurt, hurt rather than maim, maim rather than kill, kill rather than be killed. That’s the one rule of thumb I recall from my long-ago Tae Kwon Do days. It’s a philosophy I hope they still teach, as Ethan is clearly a gentle soul…and training in the martial arts (in my opinion) reiforces a life on non-violence and avoidance sensibilities. Most exciting of all (because he looks so darn cute) Ethan adds the “Dobak” to his growing collection of traditional Korean clothing. 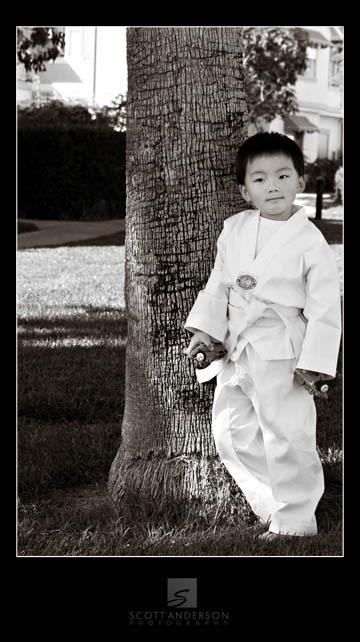 The Dobak is his Tae Kwon Do uniform. He also has his “Hanbok” (literally means Korean Dress) that travelled with him from Korea, which he wore for his one-year-old photo shoot. The white color of his Dobak symbolizes his “oneness with the universe.” Not sure about the trains though…hard for him to make a fist with Percy and Thomas the Tank Engine in his grip….but they might come in handy when he breaks his first board.